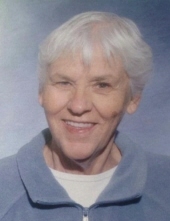 Mary Jo Harris, age 75 of Council Bluffs, passed away September 28, 2018 at Northcrest Living Center. She was born in Council Bluffs on October 5, 1942 to Arthur and Phyllis (Putnam) Wilson; who preceded her in death. Mary was a loving sister, mother, grandmother and great grandmother. who will be sadly missed and fondly remembered. In addition to her parents, she is also preceded in death by her sister Connie Clark. Mary is survived by her daughter Beccie Newberry; sons Wayne Konfrst and Penny Barton, Greg Konfrst and wife Sherri; eight grandchildren and eighteen great-grandchildren; brothers Al Wilson and wife Marlene, Bud Wilson and wife Debbie. To send flowers or a remembrance gift to the family of Mary Jo Harris, please visit our Tribute Store. "Email Address" would like to share the life celebration of Mary Jo Harris. Click on the "link" to go to share a favorite memory or leave a condolence message for the family.